This group arranges visits to a wide variety of places of interest. These visits are monthly but not on a set day. January 13th Esseborne Manor for lunch. February 14th Tidworth Garrison Theatre. Guided tour of St John's House, lunch, and guided tour of the Abbey. March 1st Quester One Planning Meeting, to be held at 2 pm and including a speaker giving a talk about the Great Wall of China. St. Michael's Church Hall, Colebrook Way, Andover. March 29th Andover Library, Talk & Tour. Morning tour of RNLI and lunch; afternoon guided tour "Discovering Old Poole". April 17th Solent Fort Spitbank. Boat ride, tour and lunch. Day visit with guided tour of the Old House, lunch, plus free time. May 31st Behind the scenes at Wimbledon. June 12th Buckler's Hard Historic Village. Two guided tours plus boat trip. 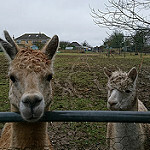 June 25th Walking with Alpacas. June 28th Quester One Planning Meeting, to be held at 2 pm. July 4th Lyburn Farm Tour and Supper. July 14th Quester One BBQ at Wherwell Cricket Club.